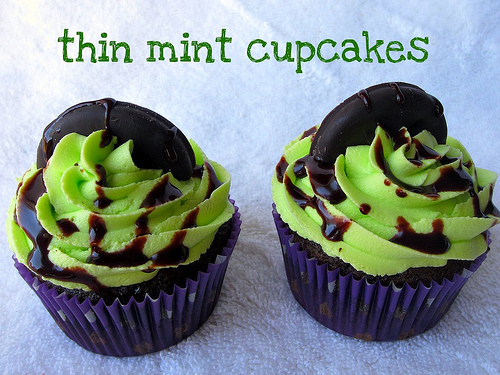 Sugarcoated: Thin Mint Cupcakes For Two! Aww sookie, sookie. It's Girl Scout cookie season! I can't remember the last time I bought a box of these cookies from an actual Girl Scout. Most of my encounters with ordering usually consist of a sign up sheet in the office break room. How I miss those little chickadees rolling up to my doorstep with their bright green uniforms. It reminds me of the days when I pathetically spent about 1 month in Brownies. What's especially exciting about this recipe I'm sharing is the fact that it's for two cupcakes! Yeah, just TWO cupcakes. I'm sure you know the feeling... you're craving some baked goods, but you're lazy and don't wanna bust out a baker's dozen of anything. Well this the state of mind I was in last Wednesday. A two cupcake recipe was just the ticket. I whipped up a chocolate cake (without the eggs and butter, super wicked easy!) and tossed in some mint and chopped up thin mint cookies. 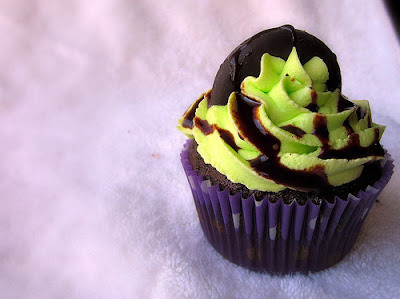 I mixed up some mint buttercream, drizzled a chocolate glaze over and crowned this beauty with a thin mint cookie. This is probably the best thing I have ever done in my life. I could totally be graduated to a Girl Scout because of this one. Plus it's reallllly simple to make. I suggest you get in the kitchen and try it. Like NOW. Beat butter and sugar together until light and fluffy. Add milk and milk extract until smooth. 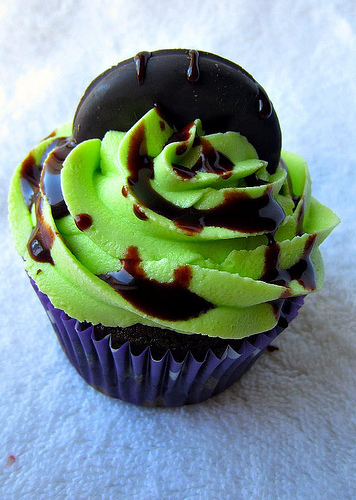 Mix in green food coloring until you get a green color that's to your liking. Pipe the cupcakes with the frosting, drizzle with some chocolate glaze or syrup and topp with a halved Thin Mint cookie.